Nice one MM. 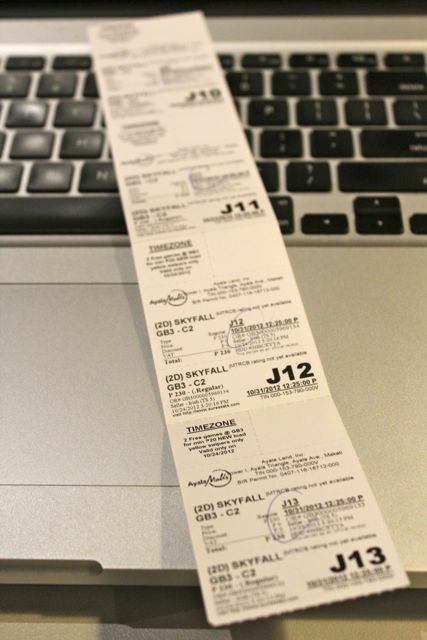 Hope to win ‘coz my husband is a big Bond fan! Very nice gesture for your crew, they are very lucky to be working with you. There are not too many bosses like you nowadays. James Bond for the win!!! Hope that Skyfall will be better than Quantum of Solace ! Noelle, all early indications are that it is better… Remember, Quantum of Solace was finished when scriptwriters were on strike, so a significant portion of it was done without a script! :) Bond trivia for you. Then MGM went into bankruptcy, hence the 3+ year wait for this film, thank goodness they came out of receivership in time to do Skyfall for the 50th anniversary of the 007 franchise. So if you go on a date with your significant other plus food and drink, it will cost us about $50.00 just to see a movie…oh well it’s James Bond and I can’t wait to see it. Are you going to have them make a run for it too, MM? Heehee…. Ok, heading off to like your FB page now! I deactivated my Facebook account last year. :( So much for a shot at winning those tickets! Me and Hubby are huge 007 fans, not to mention die hard chicharon eaters. It’s a private joke that we would go on movie dates munching chicharon with vinegar while other lovebirds are eating fries and pop corns. I would really love to win. Imagine sitting beside my one and only love, facing Mr. Bond on the huge screen, and eating Zubu Chicharon. Not to mention getting to watch it with you MM. What more can one ask for? Heaven on earth! Err… is it bad how I’d only like to score the chicharon? hahaha! Press like already on facebook! Good luck to MM Followers in Manila!! Cool contest!! ay kaya pala hindi ako maka-open ng site mo kaninang umaga dahil sa contest mo. haha..
ohh no.. i missed this one..